Sofitel is celebrating its 50th anniversary and the chain’s flagship property in London Sofitel St. James is offering 2,500 bonus points + a Silver status after one stay. This offer is valid for stays between August 11 – October 27, 2014, that are booked by September 25. You can access Sofitel St. James’ website here and Accor’s web page for this promo here . It is unclear from the terms and conditions whether you an earn this bonus points offer more than once. This would be a nice bonus for a one night stay at the Sofitel St. James in London. There is nothing on the term and conditions indicating that you would need to book a specific rate to be eligible for the bonus points. 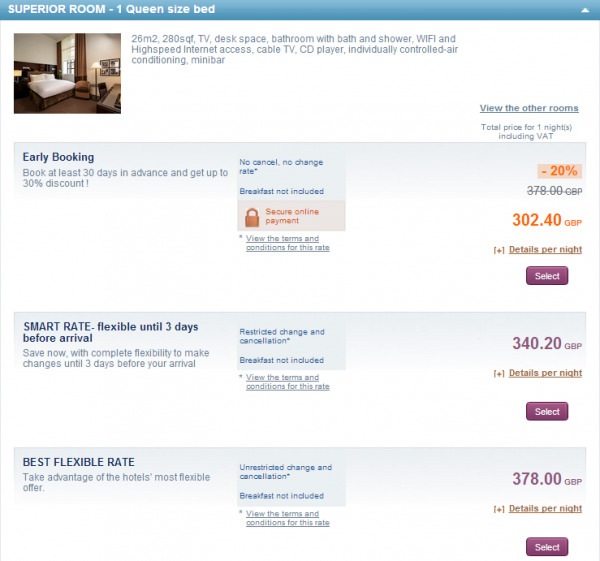 General Le Club Accorhotels terms and conditions apply to the “Sofitel St.James 2,500 points” offer. This offer is valid for any the’Sofitel St.James 2,500 points’offer stay of at least one night made between 11/08/2014- 27/10/2014 in one of the participating hotels, and booked between 11/08/2014- 25/09/2014. This offer entitles Le Club Accorhotels Loyalty members, regardless of their status, to benefit from earning 2,500 bonus points in one of the participating hotels in the UK&I. You must book your stay ahead of time on-line to benefit from this offer (www.accorhotels.com or brands.com) or via our Accor call centers. Reservations that include several rooms covered by the same member during his or her stay are only counted as one stay. *2,500 points is approximately 40GBP based on time of sending – actual value may fluctuate based on exchange rates. **Members will become Silver Status Le Club Accorhotels members up to 10 days after they make a valid stay.